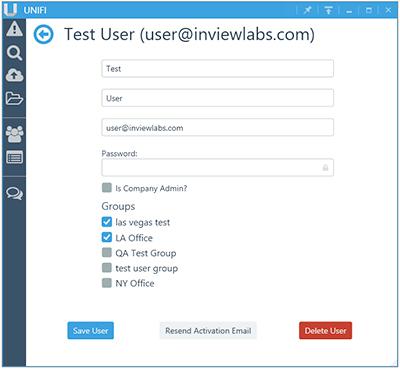 Revit Add-Ons: Unifi for Revit: "Discover a Better Way to Optimize Your BIM Content Library"
Unifi for Revit: "Discover a Better Way to Optimize Your BIM Content Library"
I had the pleasure of seeing Unifi in a demo from INVIEWlabs' Steve Germano recently. I was very impressed with their product, which they recently redesigned from the ground up. There are a lot of family browser and so-called family manager Revit add-ins out there, but Unifi is only the second one that I've seen that has a QA/QC process built into the workflow. No more upgrade screens for your content! Filtered content such as "Fire Rated Walls"
For those interested in the details, following is copy from the Discover Unifi website. Your teams will have access to your BIM content no matter where they are located. In a job trailer, at a design meeting, or working from home... no problem! Our cloud provides global access to your content when you need it. By dragging your entire library folder structure into Unifi, the application will automatically intelligently meta tag each piece of content with the folder name making your content that much easier to find with searches and SmartFolders. Apply metatags to all content in a single batch for quick and easy searching & SmartFolder intelligence. Once uploaded your content is then mined for data. Family categories, family types, parameters & values, and intelligent keywords are extracted from each piece of content uploaded to your library. Your teams will now be able to search in any way that they want and the Unifi search algorithm will find what they are looking for! This advanced searching algorithm also learns from your teams as they search. The more you use Unifi, the more intelligent and relevant content becomes as it learns from you! 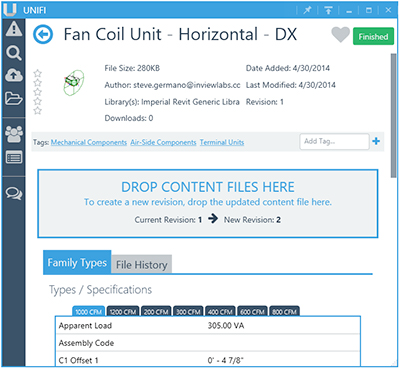 Upload your oldest version of your company library and Unifi's cloud will upgrade all files to newer versions of Revit for you. 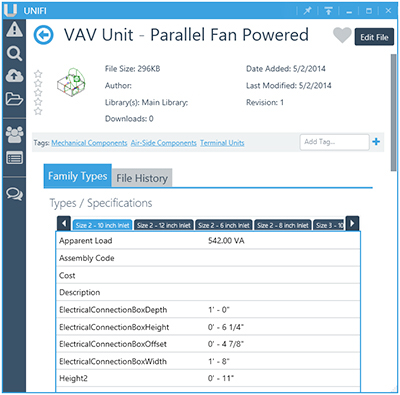 If you're working on a 2012 Revit project, Unifi will provide you with the 2012 version of the family to insert. If you're on 2014 project you will get the 2014 version of that same piece of content to insert. Your teams will rejoice as they will never again have to wait for content to be upgraded before inserting into their projects, saving them time and your firm money! The fastest way to find your BIM content. Period. BIM content management is all about providing your design teams quick and easy access to the digital assets that they need when they need it most, at the time of design. Unifi provides just that! Your teams can now quickly search for what product models they need and insert them into their designs in seconds. Looking for a particular product model and would like to know which company families or components are available, and which manufacturers have models available as well? 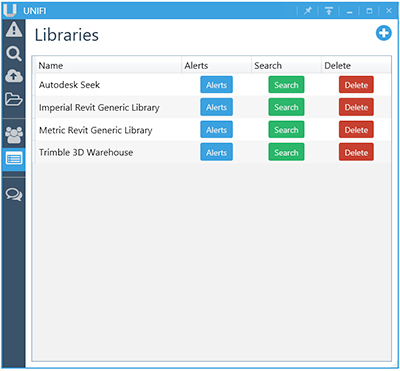 With a single search, Unifi will search your company content as well as manufacturer content through some of the worlds' leading online repositories such as Autodesk Seek, Trimble 3D Warehouse, and more. It doesn't matter how you search, Unifi will find the right content you're looking for. Unifi's search engine was designed from the ground up to understand how building architects, engineers, and contractors think. With advanced understanding of industry acronyms and terms, deep analysis of parameter metadata, and keyword associations your teams search, find, and insert what they are looking for. FAST! Spend more time designing better buildings and less time looking for the right content! SmartFolders are intelligent queries which can be used to intelligently group content in new ways. Provide your users with content grouped by discipline, sector types, or client. Admins can use SmartFolder advanced filters and search terms to dynamically group their content for their teams. 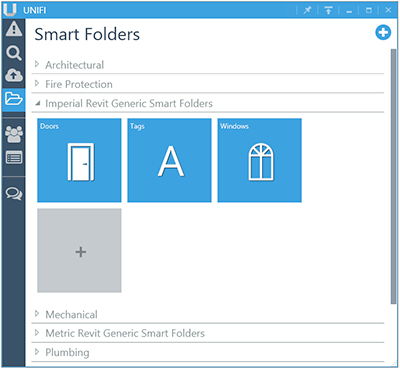 Let's say you want to provide a SmartFolder for all of your 480-volt Mechanical Equipment from a certain library, or all of your 5-Star rated door families... with Unifi this is a breeze! As new content is added to your libraries, content that matches the SmartFolder filters will automatically be shown in the SmartFolder making for zero Admin maintenance. You can't do that with Windows Explorer! It's all in the workflow! Built-in firm-wide workflows assist in maintaining content consistency, quality control, and eliminating repetitive tasks. 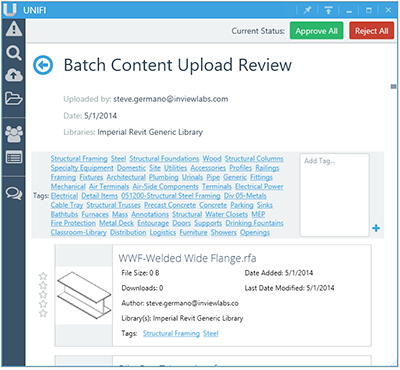 Content requests, content upload approval processes, and content ratings were designed around firm workflows providing insight into your libraries and seamless control over the quality of your content. Anyone in the firm can create new content and add it to a library which instantly sends off an alert to Admins that new content is available for review. Admins can review content individually or by batch and approve / reject the content while providing notes back to the author about what they may need to fix. 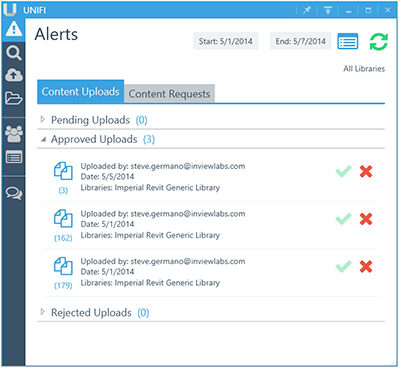 The Alerts screen provides an intuitive interface to see new content uploads and content requests by all users. Quick sorting and filtering tools are available to filter via date range or by library. Dealing with hundreds or thousands of content uploads, no problem! Unifi was designed to scale to meet the demands of the largest international firms to the small design shops. Admins can review in batch hundreds or thousands of files quickly and easily. You can approve or reject all items in the batch, or select individual content to approve / reject. You can also batch metatag the content for increased searching capabilities or use within SmartFolders. Many firms have certain personnel who are content creation specialists that make the majority of the company content used for all projects. 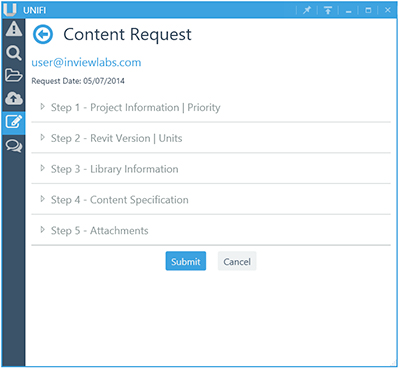 With Unifi's Content Request Form your teams can fill out a request for content to be created for a library. Admins then receive instant alerts with the request specifications and can get to work! Submit the request and it's on its' way! Each request is individually tracked and when one Admin sets the request to In Progress other Admins can see that so they don't fulfill the same request. Also, the person who submitted the request can see who is working on their request. Once the completed files are uploaded and the request is marked complete the requestee is instantly alerted and can easily get to the content they asked for! 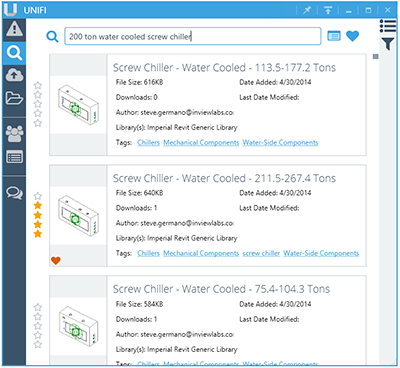 With little to no IT involvement required, BIM managers can completely control user access, library management, and deployments directly within Unifi. Because of the Unifi cloud, there is no expensive onsite server gear required! User management is painless with Unifi. You can simply batch load in hundreds of users from an Excel spreadsheet. Each user will get an email with the download link and a temporary password. Users can also be added one at a time... if you really want to. You can group together users by office, discipline, or any other way that works for your company. Groups can be provided access to certain libraries and managed as a batch. Adding users to a group is quick and easy. You can add them one at a time or Add All. Have hundreds of users? No problem. We've built in a quick search filter so you can find who you're looking for, fast! Libraries are a great way to group your content and limit the access by certain users or User Groups. Admins can be assigned to certain libraries which will determine who will receive upload and content request alerts. The choice is yours to decide how you would like to organize your firms' digital design assets! 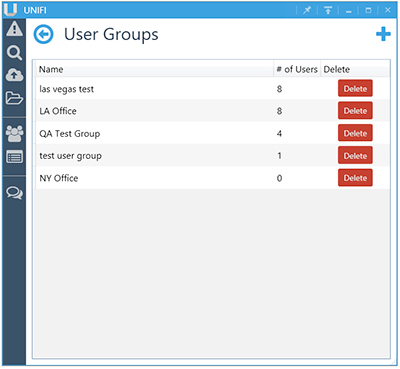 Revisioning of files and File History is built into the Unifi platform. Each revision of a file can be noted so anyone can see the notes about the changes made from revision to revision. Anyone can drag and drop a new revision to a file and it will kick off the QA process by alerting the Admin for approval. Once approved the file has been revised and the Unifi cloud will create all new versions of the file. Each revision is stored in the Unifi cloud and acts as a backup solution should an older revision of a file need to be restored. Admins can easily roll-back to previous revisions at any time. The Unifi platform can easily become your firms' Digital Design Asset Management platform with full content revision control! There's more information available on the Discover Unifi website. In the interest of full disclosure, Unifi is a paid advertiser on the Revit Add-ons blog. However, I make every effort to insure that doesn't influence my opinion on products.